A fullscreen carousel template with 3 image slides, autoplay and captions. 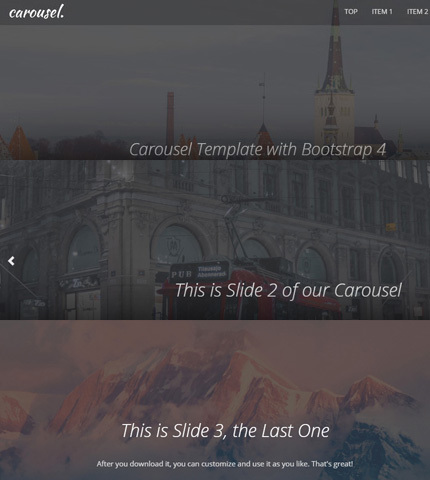 A fullscreen carousel template with 3 image slides, autoplay, captions and controls. A fullscreen carousel template with 3 image slides, autoplay, captions, controls and indicators. Download the zip package below and extract it. Each template is in its own folder called “template 1”, “template 2” and so on. Use the “index.html” file to modify the HTML code. The style can be changed in the “style.css” and “media-queries.css” files, in the “css” folder (assets/css).